Thank you so much for visiting Silk Road Treasure Tours' website. I welcome you here to view the lands of the legendary Silk Road in Central Asia and beyond. 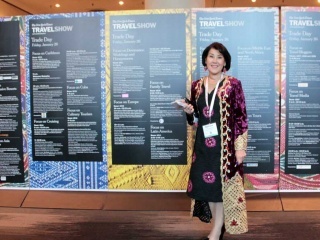 As founder and president of Silk Road Treasure Tours and as a native of Uzbekistan, it would be my greatest pleasure to arrange your trip of a lifetime through my homeland and the neighboring countries of Central Asia, the "stans," the Caucasus, China and Mongolia. I love them, know them all well and can promise that throughout your journey, you will receive the warmest welcomes in the world. Come and experience 3,000 years of history and tradition, breathtaking landscapes and exciting spectacles. Serene adobe walls, the thrum of the tambour, glittering mosaics and the bustle of the bazaar will thrill your senses. Brilliant patterns on ikat fabric, the aroma of freshly baked bread from clay ovens and inspiring ancient sites will become personal memories from your journey to treasure forever! Please remember, "Your Wish Is My Command." My team and I are dedicated to providing you with the superior service you deserve including: customized itinerary planning, detailed travel arrangements, visa assistance, smooth and secure border crossings, the best in accommodations, and experienced, knowledgeable local guides. Make this your year to discover all that Silk Road Treasure Tours offers you!